Bit of a bumper-fun bonus this week, with not one, not two, not three but FOUR recipes, each named Paradise Slice. Initially I was just going to make a post with two contratic recipes, but I got a bit carried away. It all started with me reading a recipe in a small, vintage paperback pamphlet from the S.W.R.I. of Shapinsay, in Orkney. Their Paradise Slice comprised a rich, almond sponge, studded with dried fruits, candied cherries and baked in a shortcrust pastry case. Lovely, I thought. Baked it, and decided it needed tweaking a little, so made it again, this time with my crisp, cornflour shortcrust, which makes for a delicious contrast with the rich, buttery almond sponge, and also swapped in some confit fruit I’d bought on holiday in France. Then I discovered a much-requested Paradise Slice in the Los Angeles Times, which was very different indeed: dark, rich, chewy and studded with pecans. Lovely, I thought – right up until I read how many calories it had per serving. So I did some tweaking and also reduced the batch size, making a slice now only 200 calories as opposed to, originally, over 500. Then it occurred to me that I shouldn’t forget people with gluten intolerances. So I adapted a recipe from Sainsbury’s magazine that used as its base a mixture of popcorn and rice cereal. With a few more tweaks I managed to get each slice of this particular paradise down to less than 100 calories. Lovely, I thought. Finally, being inspired by all these delicious contrasting bakes, I decided to create my own Paradise Slice. I wanted it to have similar tropical ingredients, but be a different texture and flavour experience. I took the topping from the Hungarian Cheesecake and added lime and orange zest and juice, because the acid in the citrus juice reacts with the condensed milk to make a cheesecake-like mixture without all the faff. I mixed in some crushed pineapple and desiccated coconut and also stirred through a little creme fraiche for sharpness. I poured this onto the base from the L.A.Times recipe and left it to set in a cooling oven before chilling in the fridge. The result is fantastically tropical, fresh-tasting and not overly sweet. It cuts beautifully, as the coconut takes up excess moisture as it sets in the oven, and can be enjoyed as a dessert or as an accompaniment to coffee. Best of all, it too is a storecupboard recipe, especially if, like me, you have a bag of Seville orange zest/juice cubes in the freezer (I cannot recommend this highly enough, so useful to have their tangy, bitter/sharp flavour on hand throughout the year). The original recipe called for sultanas, raisins and glace cherries in equal measure. Nowadays we have a much wider selection of preserved fruit, so I heartily encourage you to go wild with whatever combination you fancy – mango, papaya, apricots, candied peel – whatever seems like paradise! 4-5tbs jam – I suggest apricot, but anything slightly sharp will be suitable also. Roll the pastry out thinly (3mm) and line a greased (and lined if liked) baking tin of dimensions roughly 18cm by 28cm. Prick the base with a fork. Line with baking paper and beads/rice and bake for 12 minutes. Remove the baking paper and beads/rice and bake for a further 8 minutes for a total of 20 minutes. Brush the hot pastry with jam and set aside while the rest of the filling is prepared. Reduce the oven temperature to 180°C, 160°C Fan. Toss the fruit in the cornflour until thoroughly coated. Tip into a sieve to remove the excess cornflour. Add the eggs, one at a time, mixing well each time. Fold in the flour and ground almonds. Stir in a little milk until the mixture is of a dropping consistency – that is, it drops freely from a spoon. Spread half od the mixture over the pastry case. Stir the fruit into the remaining half of the mixture, then drop in spoonfuls over the plain mixture. This method will help prevent the fruit immediately sinking to the bottom of the sponge. Smooth over the top and bake for 30-40 minutes, until the sponge is springy to the touch and nicely browned. Sprinkle over the caster sugar whilst hot. Cool in the tin for 10 minutes, then remove and cool completely on a wire rack. When cold, slice into serving portions with a sharp knife. Adapted from the recipe of Bread & Cie, printed in the L.A.Times. Put the base ingredients into a food processor and blend until the mixture resembles breadcrumbs. Muscovado sugar can be a bit clumpy and this is a speedy and efficient way to break down the lumps. Spread the mixture into the prepared tin. Pack it down firmly – use a flat-bottomed glass tumbler or similar to get a really smooth, firm surface. Bake the base for 15-20 minutes until lightly browned. Set aside to cool. Whisk the sugar, eggs and vanilla until creamy (about 5 minutes). Stir in the flour mixture, the coconut and the pecans. Pour this mixture over the base and smooth over. Bake for 40-45 minutes until set. When cold, cut into 16 bars,. This paradise slice is a variation on the rice krispie bar but with the added flavour of popcorn. I’ve decided to use air-popped popcorn, to reduce both the sugar and fat content. Air-popped corn uses no fat in the pan, just the heat from the stove to make the corn pop. I also tweaked the original recipe to include more fruit. The quantities below are to be seen as guidelines only – use whatever mix of fruit and nuts takes your fancy, just keep to the overall weight of fruit/nuts to no more than 250g. Put the popping corn into a clean, dry saucepan and cover with a lid. Put the pan over medium heat and shake it vigorously to keep the kernels from burning before they pop. When all the popping sounds have ceased, tip the popped corn into a bowl to cool. Wipe the pan with a clean cloth. Pick out any un-popped kernels. When cool, add in the rice cereal, fruit and nuts and mix thoroughly. Line a large baking tray (24cm x 36cm-ish) with foil and grease lightly with either spray or butter. Put the marshmallows and butter into the pan and heat gently until both have melted. Stir thoroughly. Add the dry ingredients to the pan and stir well, ensuring as even a coating as possible for all of the ingredients. Pour the mixture into the prepared pan and press down firmly. If you prefer to use your hands, cover the mix with some greased cling film first. Chill in the fridge until completely cold, then cut into 32 fingers. This is possibly the easiest, in terms of effort, of all four recipes, as it is mostly just letting the oven or the fridge do all the work. You can use any two citrus fruits you like, but I don’t recommend two of the same, as then they tend to gang up on the other ingredients and overpower them. And definitely not two Seville oranges – the bitter is too much for the pineapple. I’ve also tried this with fresh pineapple for an even fresher taste, but the juice content didn’t allow it to set as firmly as I’d have liked. Were I to try this again, I’d sprinkle the chopped pineapple with sugar to help draw out as much moisture as possible. Open the tin of pineapple and tip it into a sieve over a bowl. Leave to drain for about an hour – you want as much of the juice to drain out as possible. Mix the condensed milk, creme fraiche and citrus together and stir thoroughly. With a spatula, press the pineapple firmly to extract as much juice as possible. Yes, even after an hour’s draining. Repeat several times as necessary. When no more juice can be squeezed from it, add it to the condensed milk mixture and mix well. Finally, stir in the coconut and set aside until required. Bake the base for 15-20 minutes until lightly browned. Pour the filling over the cooked base and smooth over. Return the tin to the oven and switch off the heat. Leave the tray in the now cooling oven for two hours, then remove and leave to cool, if necessary. Finally, chill thoroughly in the fridge (probably another 2 hours). Store in the fridge either covered or in an airtight container. Mention fruit cake in conversation and many people’s eyes will glaze over at the image of dark, heavy, dried fruit cakes of wintertime, but with this recipe you can make a light, fresh, sponge cake with a burst of freshness in every bite. Regular listeners will recall my long quest for the perfect Apple Cake, as detailed in (shameless plug) MY FIRST BOOK – and the proportional recipe I found proved not too wet or heavy, lightly cakey, and with a real flavour of the fruit shining through. This is the soft fruit version of that cake and has the added versatility of being able to be used as a base recipe for lots of different kinds of soft fruit. 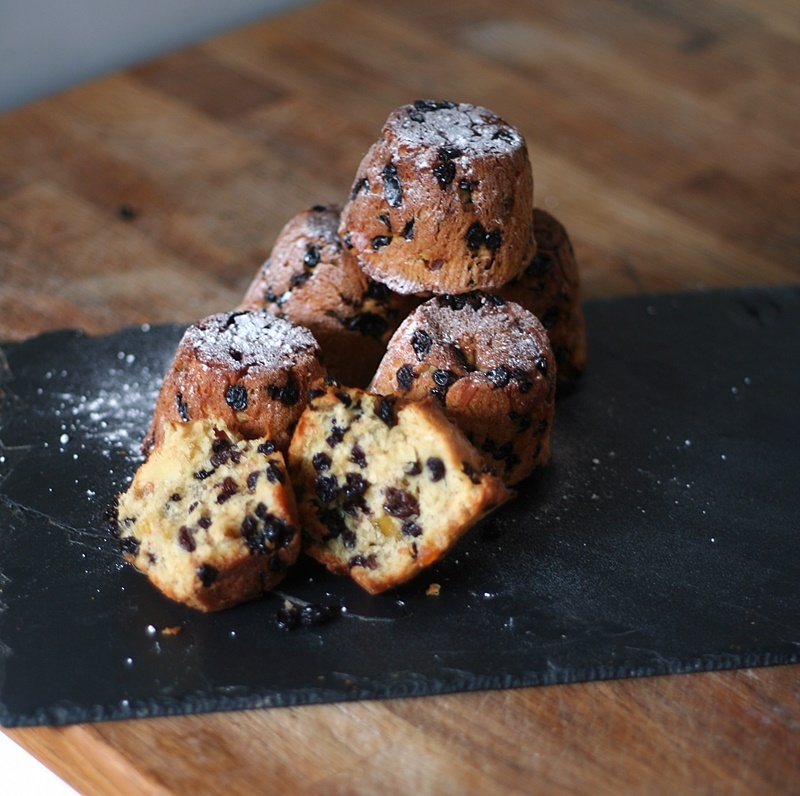 It is adapted from a recipe for Blackcurrant Cake in Mrs C.F.Leyel’s Cakes of England (1936)¹. The original recipe called for fresh blackcurrants, but in the 21st century, not as many people have their own fruit bushes, or even access to a PYO fruit farm. What we DO have access to is frozen fruit, picked and preserved within hours to maintain their quality. As well as bags in supermarkets, many farm shops also have ‘scoop your own’ fruits and berries in their freezers, to which you can help yourself to as much or as little as you like. Whilst the cake in the above photograph is, indeed, made with blackcurrants, my experiments have confirmed that this recipe can be used with a whole range of soft fruits, and those fruits can be fresh, frozen or even canned. The fruit makes this cake lovely and moist, and the sweetness of the cake itself contrasts deliciously with the sharp bursts of flavour from the berries. Due to the high levels of moisture, it is not a cake that should be baked in a deep tin, as this runs the risk of being undercooked and having soggyness in the middle. A relatively shallow square tin, or traybake is ideal. A further insurance against a soggy cake is to toss the fruit being used in a little cornflour. During baking, the cornflour will thicken any fruit juices that are released and prevent them from flooding the rest of the cake, and the cunning division of the dough means that your fruit will be evenly distributed throughout the finished cake, no matter how plump and juicy it might be. Bonus: This cake is delicious as is, but can also be served warm as a pudding with a little cream or custard. Mrs Leyel’s instructions begin ″Take equal quantities of flour, sugar and fresh blackcurrants. Rub the butter into the flour″, thereby being both unhelpfully vague and omitting mention of butter in the ingredients altogether. Nevertheless, after some experimentation, these quantities make a reasonably-sized cake. If you decide to increase the quantities, then increase the cooking time appropriately. Grease and line a 18-20cm square tin with parchment. Put the flour, baking powder and butter into a food processor and blitz until the mixture resembles breadcrumbs. Tip into a bowl and stir in the sugar. Stir through the beaten eggs to form a dough. If the mixture seems a little dry, add enough milk to make a soft, scone-like dough. Add HALF of this mixture to the tin and spread out. Sprinkle the cornflour over the fruit and toss gently to coat. Fold the fruit and any remaining cornflour into the remaining dough and transfer to the tin. Smooth over lightly. It should be about 4cm deep. NB This dividing of the dough wll help ensure the fruit is evenly distributed through the cooked cake. As demonstrated more familiarly with cherry cake, fruit has a tendency to ‘slide down’ through the cake mixture and congregate on the bottom of the tin. Adding a layer of fruitless mix in the bottom of the tin will not prevent this, merely slow the downeard progression of the fruit long enough for the cake around the fruit to cook and thus hold it in position. Bake for 50-55 minutes, turning the tin around after 30 minutes. NB Don’t be tempted to remove the cake too early. As already mentioned, the fruit lends quite a lot of moisture to the mix, so be sure that the cake is thoroughly cooked through before removing it from the oven by testing with a cocktail stick that the cake mixture is cooked and observing that the cake as a whole has shrunk away from the sides of the tin and is nicely browned on top. Sprinkle with caster sugar and allow to cool in the tin. NB The moistness of the cake means that it is very fragile when first baked, and trying to remove it from the tin whilst warm runs the risk of it breaking apart. ¹ A fantastic collection of national and regional cakes. Recommended! A French-themed post this week, but not a mountain of patisserie froth – instead I’ve gorn all savoury! Prowling round the French brocantes (posh car boot sales), I’ve always got an eye out for second-hand cookery books and this year I found a great little paperback entitled Vosges Grannies Recipes (I paraphrase) – regional recipes from the mountains in eastern France, near the German border. The booklet has lots of simple and comforting dishes, including this one, which I decided to include not only as a delicious, make-ahead meal, but also as a blueprint recipe for having up your sleeve or – more usefully – in your freezer. I especially like this recipe because it isn’t rich. Too often a gratin dish is swimming in oil from fistfuls of cheese or cream. This is altogether much lighter and can easily be adapted to a variety of fillings, including vegetarian. It also doesn’t require a trolleyload of expensive ingredients, yet it’s packed with flavour, and is very simple to bring together. Using this recipe as an example, there is a bottom layer of lightly steamed leeks, followed by a tangy tomato and bacon layer, topped with a white sauce sprinkled with cheese. The tomato layer is bright from the fresh tomatoes, bold with the favour of herbs and tangy with bacon. All of the component ingredients can be prepared beforehand, then either hauled out of the fridge and assembled and baked, or assembled and frozen until required. Imagine the joy of getting home of an evening knowing you’re just 30 minutes away from a delicious home-made meal that requires – literally – one minute’s preparation: stick your defrosted gratin in the oven, turn it on, go have a shower or read the paper, open a bag of salad, cut a slice of crusty bread and Bam! Supper is served! It doesn’t have to be leeks – other options for the base vegetable are diced swede, turnip, carrots, parsnips) or a mixture of all of these), potatoes, celeriac, cabbage (Savoy, white, red, mixture), broccoli, cauliflower, sprouts – you get the idea. If you’re vegetarian, you can substitute blanched samphire (its deliciously salty) for the bacon in the tomato sauce – add it whilst assembling your dish to keep some of its crunch. Top with white sauce or for a gluten-free option, use low-fat creme fraiche. Sprinkle with a cheese of your choice. Choose Comté or Gruyere for melty goodness, Grana Padano or Parmesan for punchy flavour. Whichever you choose, you don’t need a lot. People think a gratin is all about the cheese, and it’s not. The gratin in the photo had just 30g of Comté on the top, which was more than enough. The cheese is a garnish, if that. A gratin is about a crunchy topping. You can substitute breadcrumbs for the cheese, or a mixture of half breadcrumbs, half grana padano. If you don’t have a stack of gratin dishes – who does? That’s my one-and-only in the photo – the supermarkets sell packs of aluminium foil dishes with cardboard tops, perfect for freezing. No washing up, either! These can also be used to heat the defrosted dish up in the oven. You wouldn’t be able to defrost them in the microwave, but being in a solid block they would be easy to decant into something suitable. This recipe will make 4 portions of gratin. You can easily double or treble the quantities and make a stash of meals for the freezer. Wash and slice the leeks into 2cm slices. Put the sliced leeks into a steamer pan and cook over the simmering water for 8 minutes. You can blanch them IN the water, but they do take on a lot of liquid this way, and you run the risk of your dish becoming waterlogged. Put the bacon into a pan and heat gently. When the fat has begun to run, add the onion, garlic, tomatoes, bay leaf and thyme. Cover, reduce the heat and allow to simmer for 30 minutes, stirring occasionally. Taste, then season with salt and pepper. Discard the bay leaves. Put the butter, flour and milk into a pan and whisk gently over a low heat until it comes to the boil. Turn the heat down to a simmer and allow to bubble gently for 5 minutes to ‘cook out’ the flour. If not using immediately, cover with cling film so that it touches the surface of the sauce and set aside. Divide your components equally into the number of dishes you plan on using. In each dish, put a layer of steamed leeks – or cooked vegetable of your choice – in the bottom. Spoon over a layer of the tomato bacon sauce. Sprinkle your blanched samphire if using. Pour over a thin layer of white sauce to cover and sprinkle with your topping. Put your cold/defrosted dish into the oven. Turn the heat to 180°C/160°C Fan. Bake for 20-25 minutes if the portion-size is a single serving, 25-30 minutes if larger. When done, the cheese will have melted and browned and the sauce bubbling. Serve with a salad and crusty bread for mopping. Here’s a delicious Deja Food recipe that we regularly enjoy in this house, whenever there is some Tandoori Chicken going spare. That in itself is quite a challenge, since both my husband and daughter love Tandoori Chicken with a passion, so I find myself making gargantuan quantities purely in order to have anything left with which to make Butter Chicken. Invented at the Moti Mahal (Palace of Pearl), one of the oldest restaurants in Delhi, by Mr Kundan Lal Gujral, Butter Chicken, or Murgh Makhani to give it it’s proper name, was devised as a way of keeping Tandoori Chicken moist and flavourful from one day to the next. The dark, smokiness of the cooked chicken is enriched by the Makhani gravy of spices, ghee, tomatoes and cashews, especially if you can leave them marinading overnight. The recipe below is one that I’ve used for 5-6 years, tweaking slightly to reduce the fat content whilst still retaining the rich flavours of the dish. I’m not going to tell you how to make Tandoori Chicken, because I’d only be repeating the most excellent words of Madhur Jaffrey. Her recipe appears in Indian Cookery, a well-thumbed copy of which is gradually falling apart on one of my many shelves of cook books, but it is also available online HERE. I’m glad she has stopped advocating the lurid food colouring – it always unnerved me somewhat to see incandescent pieces of chicken on the plate. 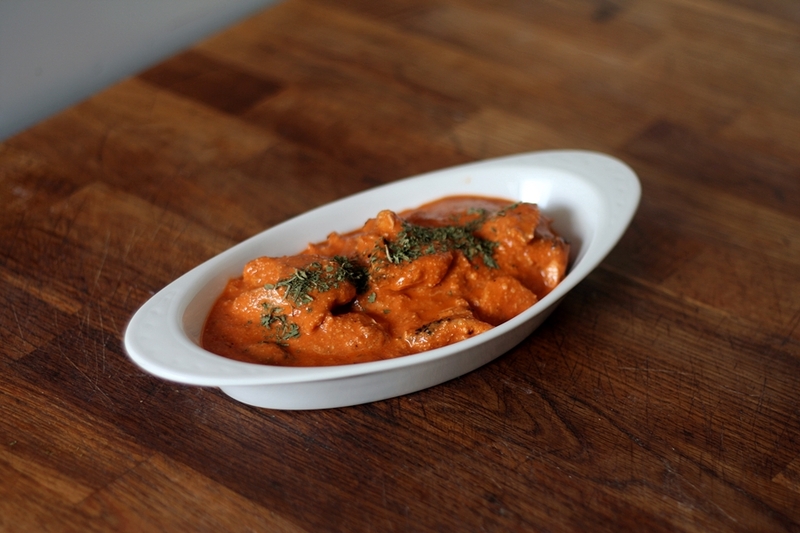 To get a little more red into my chicken, I add a generous amount of sweet paprika – the Rajah brand here in the UK gives fiery colour without the fiery heat – but since it will ultimately be lovingly enveloped in sauce, I shouldn’t fret too much about this. A couple of points on ingredients: I strongly recommend hunting out a tin of ghee, as its almost perfumed aroma greatly enhances the dish, and dried fenugreek leaves are a must for that authentic taste. Add hot spices if you like, but I prefer it without. Make a paste of the ginger, garlic and chillis by blitzing in a food processor with 4 tablespoons of water until well chopped. Melt the ghee/butter in a large frying pan and add the cinnamon sticks, cardamom pods, cloves and bay leaves. Cook for 2-3 minutes until fragrant. Add the ginger/garlic/chilli mix and cook for 2 minutes, stirring. Add the pureed tomatoes, stir thoroughly, then turn the heat to low and simmer, uncovered, for 10 minutes. Remove the pan from the heat and pick out the whole spices or sieve the sauce to remove them. Discard the spices. Pour the sauce into a blender and add the cashews, paprika, chilli powder (if using), honey and tomato paste. Puree until thickened and smooth (about 2 minutes). Stir the contents thoroughly and puree again for 30 seconds. If you’re making this to freeze, then stop now. Pour the sauce into suitable containers (this will make about 900 ml of sauce – yes, we like this sauce a LOT – and having it in the freezer can bring a meal together in minutes), label and leave to cool before freezing. If you’re preparing ahead, add your sauce to your cooked/cold Tandoori Chicken, stir, cover, and chill overnight in the fridge, otherwise add the chicken and proceed as below. Heat gently in a suitably large pan. Add the remaining ghee and the dried fenugreek and simmer for five minutes. This, however, is an altogether more delicate affair with fresh herbs and mushrooms and a splash of wine. I love this dish for lots of reasons – it’s easy, its versatile, you can cook it from scratch, but it can also be created from cold chicken and cooked pasta, which means it can be assembled in a relatively short amount of time. The sauce – if I say so myself – is AMAZING: I could quite happily eat it by itself. If you’re in a hurry, then it can be served straight from the pan as a pasta sauce – but if you have the time to make it ahead, it can also sit in the fridge in a casserole and then heat through in about 30 minutes when needed, with no need for any further attention. I don’t usually fuss too much with specific types of ingredients, but for this recipe I strongly recommend using the chestnut mushrooms if possible – other mushrooms tend to turn the sauce a rather unappetising grey. Fresh thyme is also preferable, but 1.5 tsp of dried thyme can be used instead. The amounts of both chicken and mushrooms can be varied according to taste or availability. Since the cooked mushrooms have a meaty texture, they mix well with the chicken, and can easily make a small amount of chicken stretch to a family meal. The pasta can be any shape, but shells (conchiglie) and twists (fusilli) hold sauce the best. Alternatively, egg noodles are quicker. 600g cooked pasta or cook 450g of dry pasta. Put the diced chicken into a bowl and set aside. Melt the butter and oil in a large pan. Add the mushrooms and cook over a medium heat until the liquid from the mushrooms evaporates and the mushrooms become pale golden. This will take about 10 minutes. Add the shallots, garlic, and thyme, and cook until the shallots soften and become translucent. Stir in the wine and simmer until it has evaporated, then add the mushroom mixture to the chicken. Melt the butter in the now empty pan and scatter in the flour to make a roux for the sauce. Stir the mixture for 3-4 minutes to cook the flour, then remove from the heat and slowly whisk in the milk, a little at a time. NB – removing the pan from the heat while adding the milk will help reduce the chances of lumps forming. When all the milk has been added, return the pan to the heat and continue to stir while the sauce comes to the boil and thickens. Gradually add the bouillon powder, tasting between each addition to make sure it’s not becoming too salty. Finally add a good grating of nutmeg and the parsley. If you’re eating immediately, add the chicken mix and pasta to the sauce and stir to combine. Turn the heat to low and let simmer gently while everything heats through. 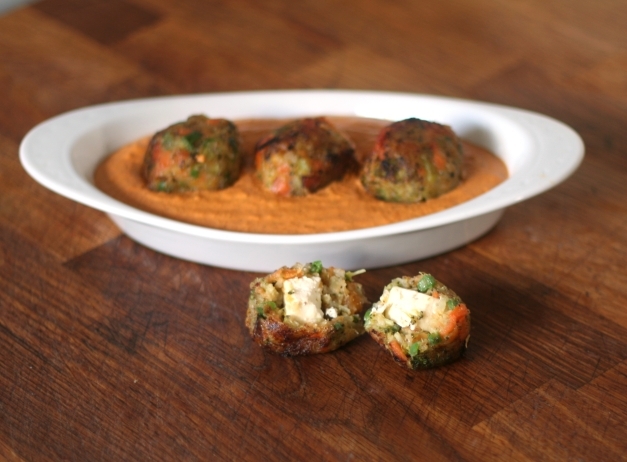 When thoroughly warmed, serve in bowls with a side salad or vegetables – broccoli and cauliflower go well . To serve later, turn off the heat once the sauce has thickened. Allow to cool before stirring in the chicken mix and the cooked pasta. Pour the mixture into an oven-proof dish. Mix together the cheese and breadcrumbs and sprinkle over the top. Cover with foil and refrigerate. To serve, put the dish onto a baking sheet (in case the sauce bubbles over) and put in the oven. Turn the oven on to 180ºC, 160ºC Fan and allow to warm for 25-30 minutes, or until the dish is thoroughly heated and the sauce bubbling. Remove the foil after 20 minutes so that the topping can become crunchy and brown. Peas go very well with this recipe, either as a side dish or stirred into the sauce itself. Turkey – This is equally amazing when made with turkey – a welcome standby to have when faced with mountains of Christmas leftovers. 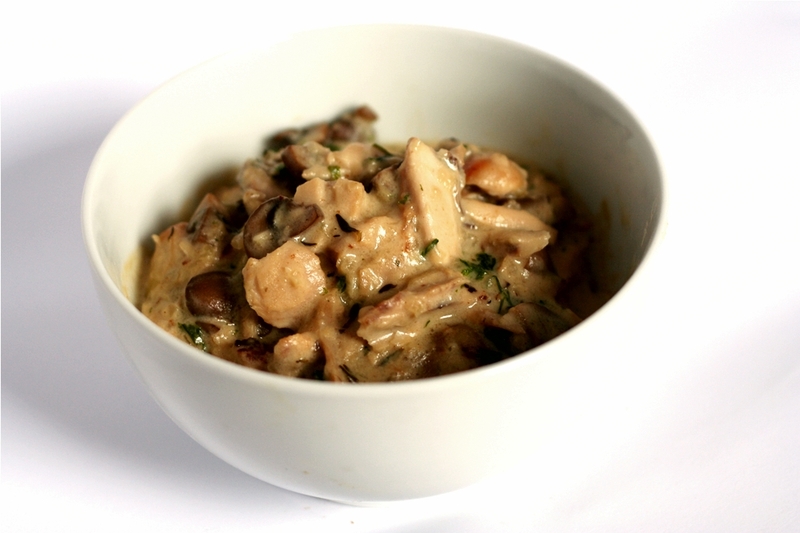 Vegetarian – just omit the chicken and increase the amount of chestnut mushrooms to 1kg. Use vegetable bouillon powder when making the sauce. Pasta – consider using long, flat pasta such as linguini. Final Festive Food recipe this week, and it’s fantastic! Fruity, spiced, zesty with candied peel, suet-free and thus vegetarian, less than 2 hours in the making/baking – and over 300 years old! I found this recipe in the manuscript recipe book of Elizabeth Philipps (circa 1694), when I was hunting for Christmas recipes. The recipe’s full title is “An excellent Plum Pudding Hot or Cake Cold”, which is just the kind of two-for-one recipe that our modern Christmas needs – especially if you’re running late and missed stir-up Sunday. Excellent example of Deja Food too! The recipe is marked with the annotation “daughter Green”. I think this must mean the recipe was passed on by her daughter, whose married name was Green – although there were unusual naming conventions back then; perhaps Mistress Philipps had a rainbow of daughters? We can but guess. As if the title wasn’t endorsement enough, a later hand has also awarded a tick and the comment ‘good’. This made this recipe a culinary ‘dead cert’ in my opinion: something that was so delicious when tasted, the recipe was requested and recorded by hand in the family recipe book, and this approval was then endorsed by a third party coming across the recipe at a later date. 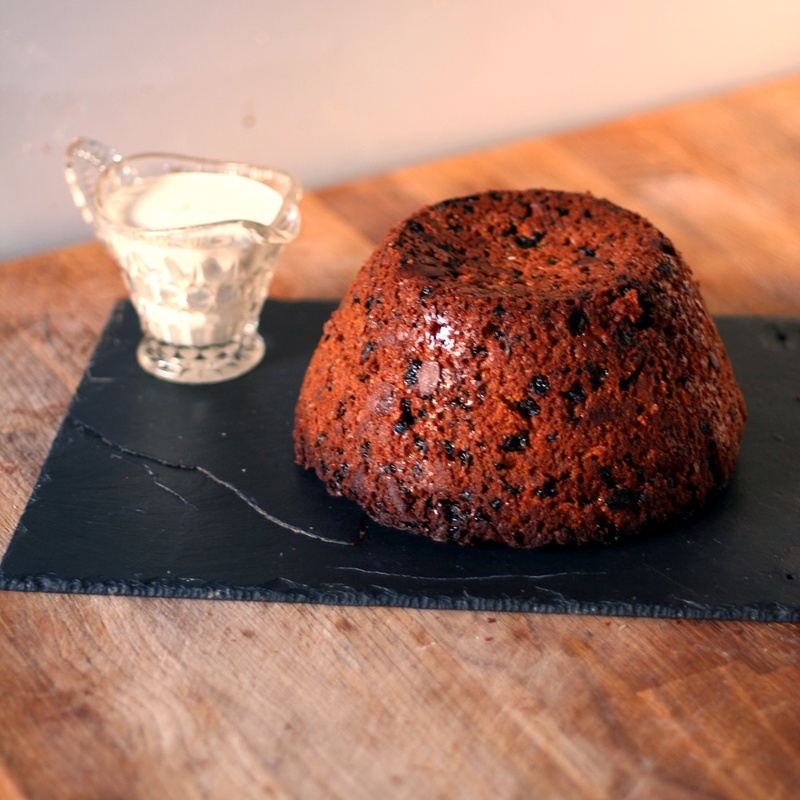 You can bake this in a regular cake tin, but a ceramic pudding bowl works just as well, and makes the resemblance to a Christmas Pudding much clearer. The hour-long baking time creates a wonderfully dark and crunchy crust, which contrasts dramatically with the light, pale insides. You can also bake it in individual pudding bowls (the recipe makes 10 small puddings), which looks very sweet too, although the shorter cooking time makes for a paler outside. 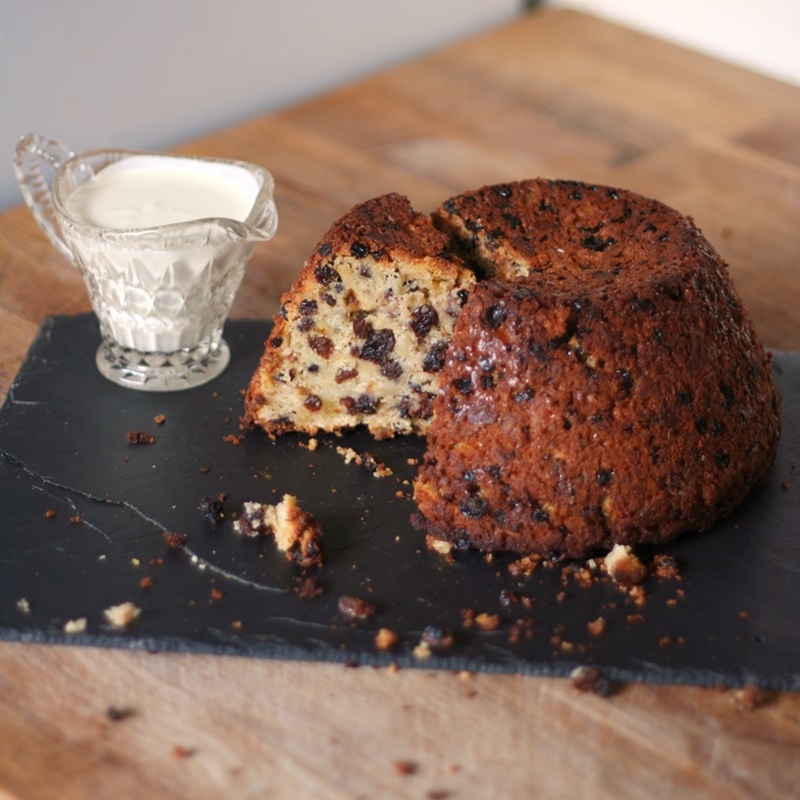 This would be too much traditional Christmas Pudding for one person, but this pudding is a yeast-raised, light, fruited, cake texture, and much more refreshing to the palate as well as being easier on the stomach. I’ll be putting up a Festive Food Index at the weekend – suggestions from the blog over the years, including this year – on a single handy page, but apart from that, this is the final blog post this year. Happy Holidays to all and I’ll see you in 2015! Mix the flour, yeast and spices. Put the sugar, butter and milk/cream in a pan and warm gently until the butter is melted. Add the sherry or mead. If the mixture is still hot, let it cool a little first, then whisk in the eggs. Add the liquids to the flour and mix thoroughly. It should form a soft dough. Add up to 150ml more milk if you think it is required. Set somewhere warm to rise for 30 minutes. Stir in the fruit and almonds until thoroughly combined. If you are making small, individual puddings, each mould or aluminium foil cup will take about 125g of dough. Otherwise, generously butter a 1.6 litre pudding bowl and add the dough. Set aside for 15 minutes while the oven warms up. a single, large pudding for about an hour. Turn the basin round after 30 minutes and check for done-ness at 50 minutes. the small, individual puddings for 15-20 minutes. Remove from the oven and set aside to rest for 10 minutes. Run a spatula around the sides of the basin to loosen the pudding, and carefully turn out onto your serving plate. Serve warm, with double cream. For later: Even though this pudding is nice cold, it really is at its best just warm, so for serving later, zap slices/individual puddings in the microwave for 30 seconds before serving. I used 20g each of orange, lemon and pink grapefruit, rinsed of excess syrup, which I made using the recipe on the blog. Do try it!